Own The Summer Market & Have Fun Doing It! Close an extra transaction each month and enjoy doing it with the Buffini & Company Blitz. 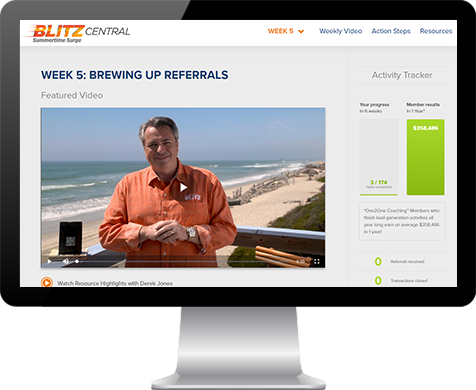 Developed by real estate industry expert Brian Buffini, The Blitz is entertainment meets education for an action-packed, step-by-step lead-generation plan guaranteed to multiply your business. Blitzers are proven top producers - they're on track to help put 12 more people into the home of their dreams this year. Fill your pipeline with quality leads, create a dependable income, and enjoy doing it! "My experience as a Blitzer is that it works! It enhanced my skills, made me more focused, and helped me connect with my clients. I've been inundated with new business – thank you!" Stay informed when a new Blitz program is ready for launch. That Blitz Program is no longer available. Please register for the next Blitz.